Why does a suburban mom in Southwest Florida care so much about a restaurant/cafe in New York City? I’ll tell you why… I was supposed to be living in NYC by now…..it was my plan since high school, throughout college, and was side-tracked by my decision to take a temporary job in Honolulu. That temporary job led to permanent work, meeting some great people, having two kids and moving to Florida. However, NYC is in my plans–just sidetracked about 10 years. I am hoping to run in the NYC marathon this November (if my name is lucky enough to be chosen in the lottery) and I keep hoping that my husband’s art will take us there (or my day job, although that is unlikely). And, if either of those things happen–it would be very useful for me to be on the up and up of New York City’s dining options, right?—-especially the really cool ones. And if media hype is any indication, Momofuku is one of those places. 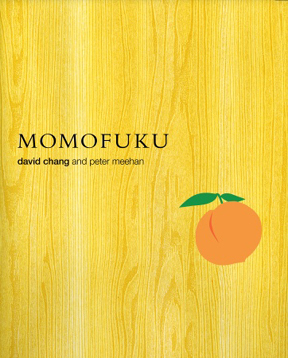 And so, in the name of potential future residence scouting, I have been doing some Momofuku research. Next, I found the recipe for the Momofuku Compost cookies on Amateur Gourmet and made them for a weeknight family dessert. The kids helped crush the potato chips and happily devoured the whole plate. I’ve posted about this before. And then, on Friday, as if the universe was trying to tell me something; a recipe for the Momofuku Crack Pie was delivered to my in-box! I took it as a sign that I would be baking over the weekend. Since I had been collecting ingredients for Smitten Kitchen’s Carmelized Onion and Cauliflower Tart, I decided we would have tart for dinner and pie for dessert. Everyone was happy about that until they heard that the “tart” was filled with vegetables—-more specifically, the grossest vegetables in the world–ONIONS! I am not going to go through the details of this recipe since I want to focus on the other pie…..but here it is. I made a few modifications primarily, I did not use truffle oil or truffle salt. I didn’t have them and I didn’t particularly want to buy them either (hmmm….salt or vacation? Not a tough decision for me). And I don’t think it mattered. The tart was creamy, with great texture from the cauliflower. Oh! The carmelized onions added the best flavor to the dish–definitely they were the key to greatness in this recipe (and I don’t even like onions….although maybe I do now). But now onto the real reason for this post. 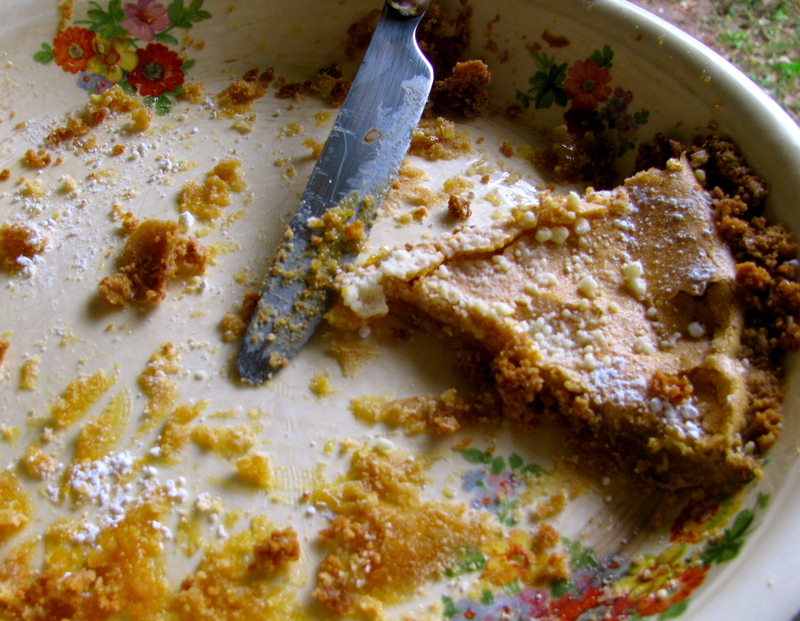 THE CRACK PIE. I guess the name of this pie refers to the fact that it is so addicting……because that it is. At first, I was very hesitant about making this. It just did not sound that good to me. Oatmeal cookie crust, ooey gooey center, and a thin shell on top—not usually what I go for. But, I couldn’t resist the hype and I knew I wouldn’t be ordering one via Fed Ex (for $45+shipping) nor getting to NYC anytime soon. It was all in the name of research! 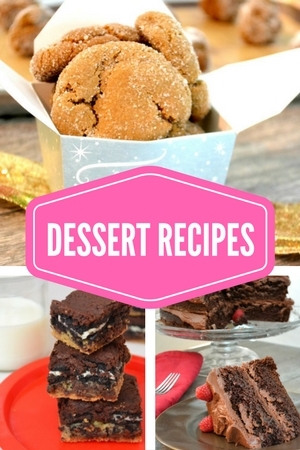 Enough talk already…Let’s get to the recipe. Note: Adapted from LA Times which adapted from Momofuku. This pie calls for 2 (10-inch) pie tins. Note: I made one very thin pie, and one very thick pie (which needed about 5 more minutes in the oven). I thought the thick one looked and tasted better. 6. 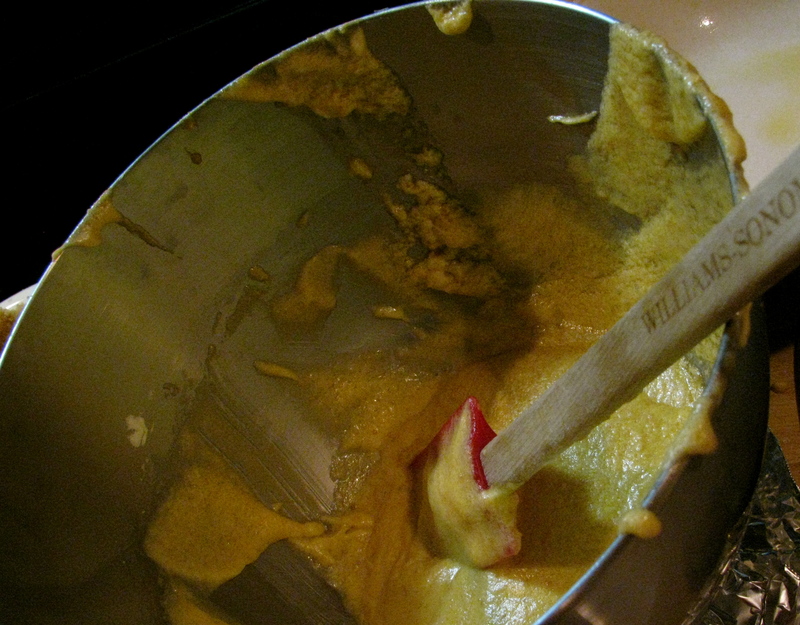 Spread the mixture onto a 9-inch-by-13-inch baking sheet and bake until golden brown and set, about 15 minutes. Remove from heat and cool to the touch on a rack. 7. Crumble the cooled cookie to use in the crust. Combine the crumbled cookie, butter, brown sugar and salt in a food processor and pulse until evenly combined and blended (a little of the mixture clumped between your fingers should hold together). Note: If you have a small food processor, like I do, you can make one crust at a time by just halving the ingredients. So, use half of your cookie crumble, 1/8 stick of butter, 3/4 T of brown sugar and a sprinkle of salt. My favorite part of the crust is the little bit of saltiness that you only occasionally notice. 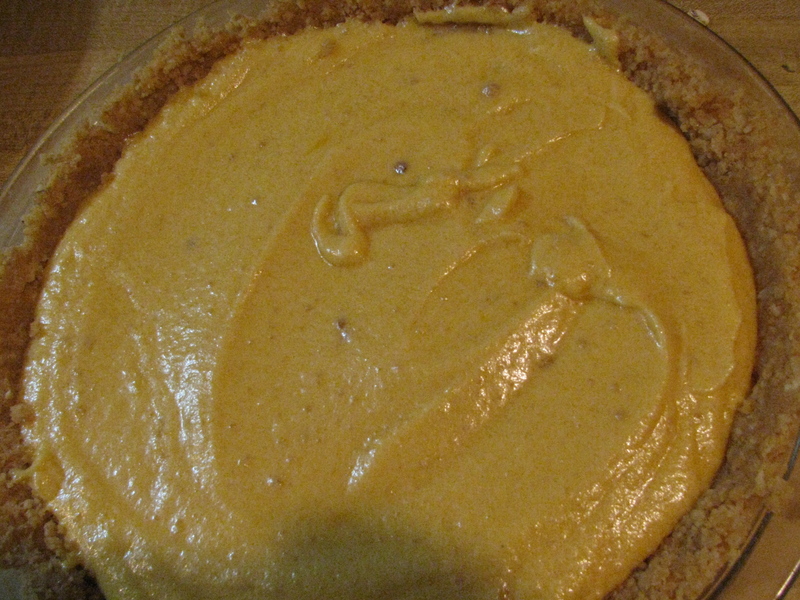 Next time, I may add a full 1/8 tsp of salt to each pie crust. Gotta love that salty sweet thing! Divide the crust between 2 (10-inch) pie tins. Press the crust into each shell to form a thin, even layer along the bottom and sides of the tins. Set the prepared crusts aside while you prepare the filling. 3. Gently whisk in the egg yolks. 5. Bake the pies, one at a time, for 15 minutes, then reduce the heat to 325 degrees and bake until the filling is slightly jiggly and golden brown (similar to a pecan pie), about 10 minutes. Remove the pies and cool on a rack. 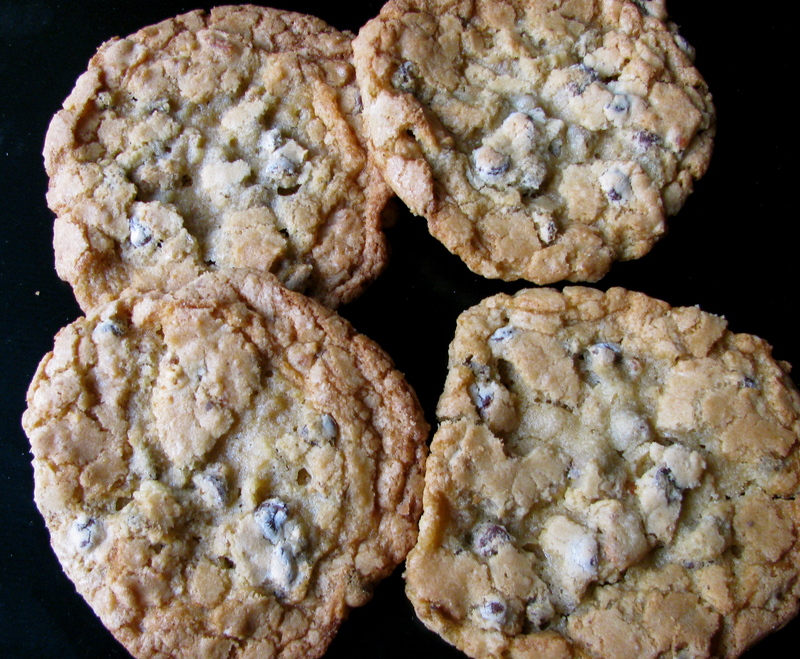 (Note: I also did not bake them, one at a time…..who has the patience for that?). I tried to give some to my neighbors and unfortunately, I couldn’t cut it out of the pan nicely. I ended up giving them three blobs of crack pie in its ooey gooey glory, piled unappealingly into a Tupperware container, ……all the while promising to them, “It really is good!” I’m sure I confirmed their suspicions that we are slightly crazy I mean, who would give their neighbors blogs of pie? But this pie must be shared (both because it is so good and no one needs that many calories) and I assure you, once they take a bite of their pie blobs, they will realize that it is one of the sweetest gifts ever.